Powered by Amaya, Hole in One will take you to a golf course where golfers try their best to reach the hole in a single shot hitting from a tee box. Fitting the theme perfectly, the symbols depict 10-A playing cards designed as flagsticks, a ball in water, a ball on sand, and other themed icons. 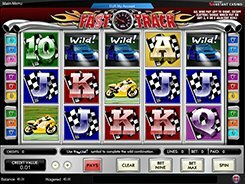 The slot is played over 5 reels and 9 paylines and allows to customize two bet options: a coin denomination ($0.01 to $5), and the number of coins per each of the lines (1 to 5 coins), therefore, a total bet ranges between $0.09 and $225 per spin. 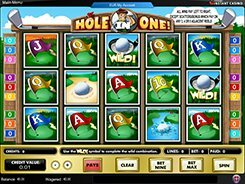 A set of features used in Hole in One is typical of many 5-reel games by this developer, and includes a wild symbol, two scatters and a bonus icon that triggers a bonus round. The wild symbol has a somewhat restricted operation as it only substitutes for two regular icons. 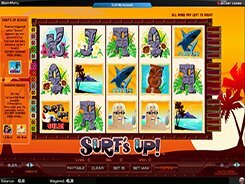 Anyway, hitting five wilds on a payline awards the slot’s largest prize of $62,500. There are two scatter symbols that pay independently and are counted as two separate icons, and landing three matching scatters on adjacent reels awards 1 to 2700 coins. PLAY FOR REAL MONEY!